Nova goes on a 26.2 mile run. This week's episode of Nova takes something of a different tack than the usual episodes. Gone are stories of history, great discoveries, and cutting edge science. Instead, this week's episode focuses on running the Boston Marathon. 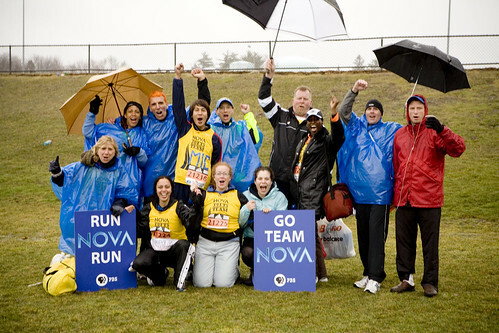 Months before the event, Nova put together a marathon team representing a cross-segment of society. There are 13 members of the team, some in decent condition, but the vast majority, if not overweight, are "over-fat." These "over-fat" people, while they weigh an average amount, have far too high a percentage of body fat. This is, the show tells us, a more and more common occurrence in our society and something that our marathoners hope they are able to rectify. The 13 members of Team Nova, as the group is called, are followed through nine months of training. Each member does solo runs during the week and then on the weekend they get together for a group run. They are directed in their training by their head coach, Don Megerle (director of Tufts' Annual President's Marathon Challenge) and Uta Pippig, a former Olympian and three-time Boston Marathon winner. Their progress is also monitored by doctors and nutritionists every step of the way. The narrator explains early on in the episode that Nova's producers have been told to expect that nearly half of their team may not make the marathon (this is why they follow so many people). However, in the end, only one member of the group drops out. The woman in question did not quit of her own choice, but rather due to a recurring leg injury that prevented her from being able to run. While this fact is a testament to the fortitude and luck of the members of the team, as well as the excellent work of the coaching staff that trains them, it makes the story of each individual member harder to tell. There simply isn't the time necessary to tell 13 individual stories over the course of an hour long episode without losing the overall narrative. Wisely, the show chooses to sacrifice some individual stories in favor of the overarching narrative. This is the better choice to make, but it means that there are people on Team Nova who speak nary a word. It certainly isn't Nova's fault that their runners are successful (it is what they hoped for), but it does hurt the storytelling. Beyond focusing on the runners themselves, the show does get into some of the science surrounding running. Animations describe the changes that the runners' circulatory, muscle, and respiratory systems undergo due to their training. Interestingly, the show never discusses the history of the marathon, and never goes into the legend of Pheidippides and the miles and miles of running the soldier did. More than likely, there simply isn't time, but it still is an important, and missing, element. The concept of this show is a good one. 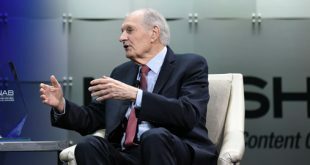 The idea allows for an examination of the marathon in general, the Boston Marathon in particular, the science of running, and provides an opportunity to tell the stories of the runners on Team Nova. It was absolutely essential that Nova put as many people on their team as they did because if they had taken fewer people they may have ended up with no one in the race and that would have been a disaster for the episode. The stories the show does tell about its runners are interesting, but not as in depth as one would like. Nova – "Marathon Challenge" airs Tuesday October 30 at 8pm. Please don't take my word for it though, check your local listings instead.